Clearaudio launches high-end Ovation turntable | What Hi-Fi? Take a look at the new Clearaudio Ovation turntable. Available in a number of finishes (black/wood & black/wood & silver/black & silver) the Ovation aims to build on Clearaudio’s existing technology to deliver "outstanding sound quality and musicality". The chassis – a combination of aluminium and PanzerHolz layers – keeps resonance to a minimum, while damping measures claim to be further improved with an internal ‘mat’ made up of 100,000 tiny stainless steel balls. 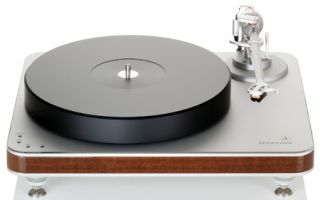 The DC motor is integrated in to the main chassis to reduce noise, while Clearaudio’s Optical Speed Control (OSC) technology works to continuously monitor, and keep exact, the turntable's speed. Featuring an aluminium sub-platter driven by a precision-ground flat drive belt, the sub platter and CNC (Computer Numerical Control)-machined main platter then float on a magnetic field thanks to Clearaudio's CMB (Ceramic Magnetic Bearing). The company says this 'floating' design means there's no need for a ball-bearing or bearing point, reducing friction considerably in an effort to deliver the best speed constancy. The Clearaudio Ovation is available now. Prices range from £4,360 to £4,610 depending on the choice of finish.